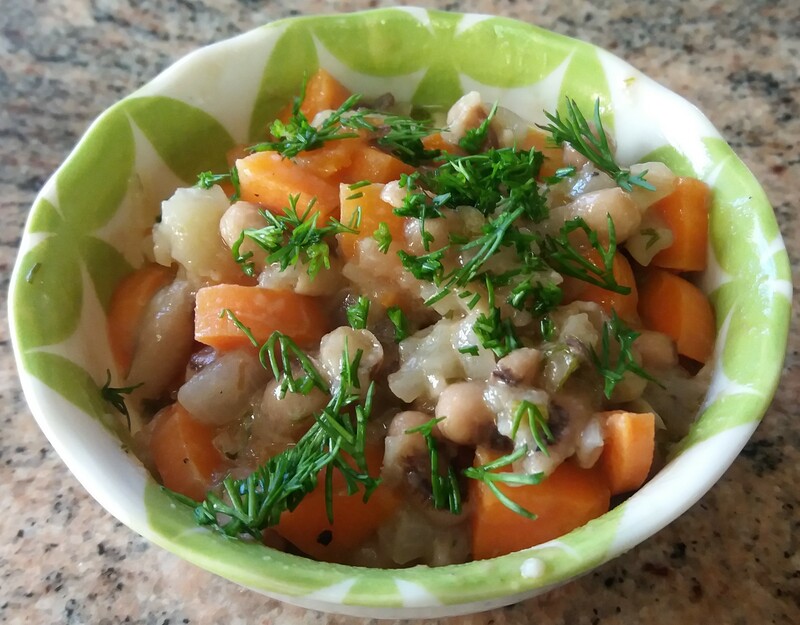 Black Eyed Peas are a great tasting legume all year round but especially on the New Year. When the bottom of the pot is warm, add oil followed by garlic. Stir so garlic is coated with oil. Let sauté for 1 minute. Add the onion, a pinch of salt and stir so onion is coated with oil. Let sauté for 2 or 3 minutes. Add black pepper to taste. Layer the carrot and then add the black eyed peas and enough water or legume juice to cover about 1/2 way up the combination of vegetables and legumes. Bring to gentle boil, cover and simmer for 15 minutes (longer if possible as the flavor will get richer over time). Add lemon juice and salt to taste. Add dill if available. Cook for 5 additional minutes. Serve warm.